Is automated driving technology reaching the school bus industry? As our colleague, Ulrik Andersson, wrote earlier this year, “there has been much attention paid to autonomous cars and trucks recently” but what about school buses? At this year’s STN Expo in Reno, Nevada, the two hot topics were electric/hybrid buses and automated/autonomous technology for school buses. These technologies work hand-in-hand to increase safety, lower fuel costs and reduce environmental impact from fuel emissions. 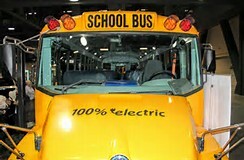 Also, many new products were introduced at the expo for use in electric/hybrid buses or that could be used in conjunction with emerging technologies such as automated/autonomous vehicles to the benefit of the school bus industry. Mr. Andersky said, “The number one non-negotiable factor is that automation and other ‘smart’ functions cannot replace human control in school buses.” But, automation can make driving a school bus safer and easier for the “[…] driver, students, and nearby vehicles.” Also, as Ulrik suggested, “Instead of replacing the driver, automation should improve traffic safety, working conditions and reduce environmental impact.” Automation has reached trucks however for school buses it is still years away. Rain, snow and ice affects braking and stopping. The stopping distance requirement for school buses is 280’. Imagine an automated and/or driver assisted vehicle with the technology to detect icy road conditions and deploy snow chains safely and within the guidelines set forth for school buses. An automated bus deploying automatic snow chains without interrupting your pick up route and disengaging when the road clears sounds very “Jetsons-like” but considering the innovations made by companies like Google and Uber, it really is about when, not if. There is currently an autonomous refuse truck equipped with Onspot Automatic Snow Chains being operated in Sweden – check out the video! School buses are “one of the safest modes of transportation” so it is exciting to see how all this new technology will impact this industry.